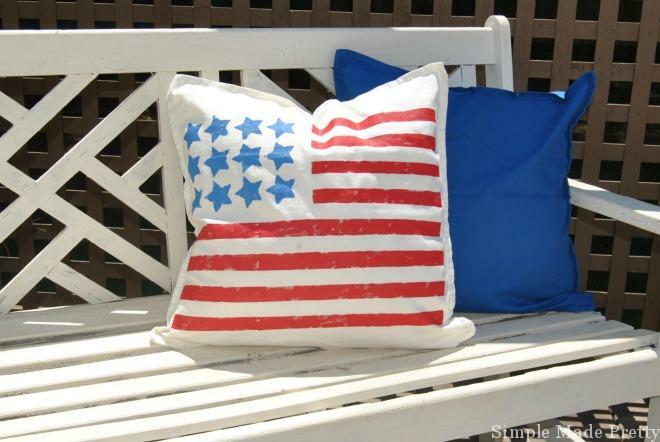 Get ready for the July 4th holiday with some fun DIY decorating ideas. I’m sharing how we decorated our living room with some fun patriotic flair that is perfect for your Independence Day celebration. This DIY patriotic gallery wall art home decor with free printables can be used indoors or outdoors and is quick and easy to put together for your July 4th events. Below is a BEFORE picture of our living room gallery wall – I like to keep it neutral unless I’m decorating for a fun holiday like Christmas and now July 4th. It’s so easy to change your existing wall art with free printables or paper crafts. The only thing I spent money on to recreate this wall for July 4th was $3 for a canvas art panel. I made this 3D star striped canvas to replace the 3D flower canvas. I also replaced the “H” washi tape canvas and by removing the “H” and adding red, white and blue hearts with a black hearts as a background. I also made the pillows on the sofa using painter’s tape and fabric paint. The covers are from Ikea. Check out my post on Smart Party Planning with a tutorial on how to make these pillow covers! Phew… it seems like a lot doesn’t it? But it really didn’t take long to put together, once you have the materials, you can complete this DIY Patriotic Gallery wall art home decor with free printables project in 1- 2 hours. Keep everything for next year instead of buying home decor since you can use these outdoors or anywhere in your home! Do you decorate your home with red, white and blue for the 4th of July? Grab the Free Printable July 4th Decor! 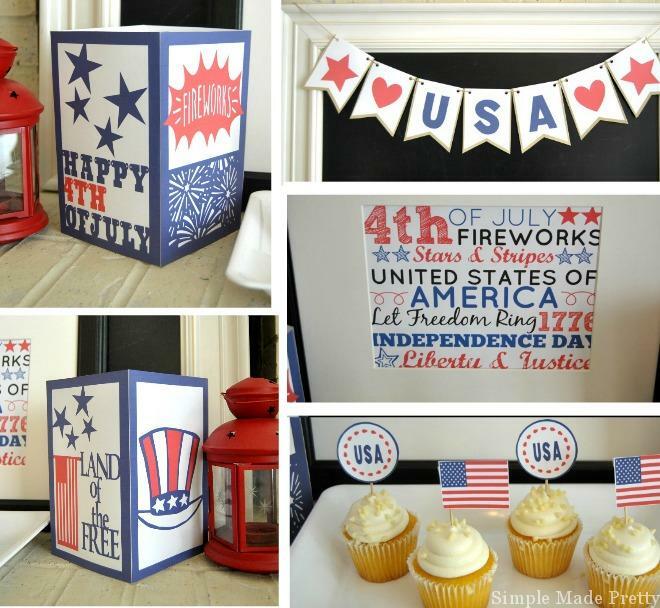 Complete your July 4th celebration with these printable cupcake toppers and lanterns to go tithe the banner and subway art! Get them here! I’ve tried twice to get access to your printables. Looking to use some of this for my classroom. Help? Hi Stacey, You need to subscribe to my newsletter to get access to my private resource library with the free printables. Access instructions are sent via email once you confirm your subscription. Please check your spam folder if you have already signed up. 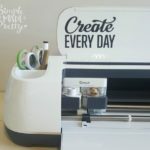 Here is the link to subscribe http://www.simplemadepretty.com/free-printables/ Hope that helps! Enjoy! I appreciate the hard work you do and that you give access to freebies. I’ve subscribed and I’ve signed in, however I seem to keep going in circles and can’t seem to get to the link of the actual printable I’m looking for. Sorry to hear you are having issues locating the free printables. 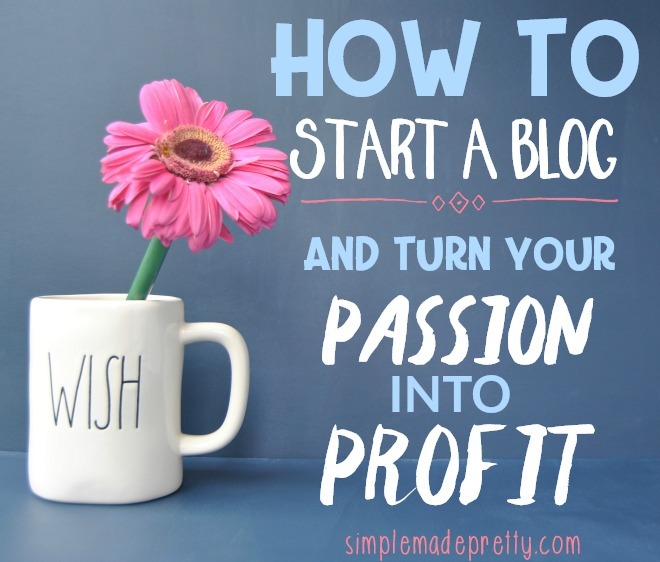 Make sure you are going to this link https://www.simplemadepretty.com/digital-resource-library/ (and not this link https://www.simplemadepretty.com/printables/ otherwise you will go around in a circle when clicking on the images). Log into the digital library using the password sent in the email. The library link was sent in the email as well. You will see instructions at the top of the page on how to download (click on the picture or right click to download the pdf). Please let me know if you still have issues after following all the steps.